All proceeds from the concert will go to Matthew Sperry’s family, and will feature some of Los Angeles’ finest improvising musicians. 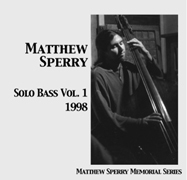 The concert is dedicated to the memory of bassist / father / husband/ Matthew Sperry, who touched so many with his love, honesty, humor, and music. 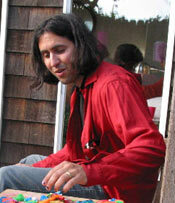 Matthew died when he was hit by a car while bicycling to work the morning of June 5, 2003. In addition to being a wonderful father to two-year old Lila and husband to Stacia, Matthew was an incredible bass player, a rising star who performed with Anthony Braxton, David Byrne, Tom Waits, and many others. There will be no advance ticket purchases – door sales only. Deep in the woods of the Pacific Northwest, artist Rodney Pond has created a memorial to Matthew from English ivy stems stripped from red alder trees. The installation is beautifully documented in words and images. To me this piece is a meditation on regeneration and how the individual and the collective resolve themselves in the cycle and rhythm of infinite variations of being, reflected in the spirit of Whitman’s “Song of Myself” and improvisitory music. The title came from a profound observation a friend’s neice made when she was five years old. Upon hearing crickets and tree frogs singing in a humid Florida night she exclaimed in wonderment “Oh! that’s the sound that stars make!”. Most pieces on Matthew connect to his music; his food-loving side is seldom mentioned. Which makes it all the more refreshing to read Patrick David Barber’s simultaneous Tribute to Matthew and Berkeley’s Slurp Noodle House.